The freelance industry is currently dominated by just a few platforms that impose high fees and excessive restrictions that limit the success and revenue of all freelancers. UberPro, the first truly decentralized freelancing marketplace, is solving these problems through the use of smart contracts on the blockchain. By eliminating the middleman, UberPro puts the power back in the hands of users, meaning they don’t have to worry about the effects third-party decisions will have on their career or business. For anyone who’s ever dipped their toes into the world of freelancing, they know it can be one of the most exciting and rewarding decisions they will ever make. If we are really honest, quitting the traditional 9-5 rat race to take control of our own time and have the ability to work from anywhere in the world is a dream for most of us. 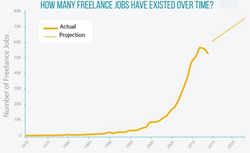 In fact, a third of the US workforce has already jumped into freelancing, while it is expected that half of UK workers will do the same in the next 3 to 5 years. And as the gig economy is worth over $1.5 trillion, these days it’s a completely viable career option. There is, however, one major issue hanging over the freelancing industry like a dark thunderous cloud. Finding work as a new freelancer can be extremely difficult. There’s no guaranteed salary to depend on anymore and making sure one has enough projects in the pipeline can, therefore, be terrifyingly nerve-racking. This is especially true for beginners, who will often turn to job boards and content mills in the hopes of getting their feet wet. The problem is that many of these platforms will exploit freelancer desperation by taking as much as 20% of a freelancer’s income. On top of that, they hold the freelancer’s livelihood in their hands by being able to suspend their membership at any time or for whatever reason, cutting off their connection to potential clients. UberPro is a truly decentralized freelancing marketplace. This means that it provides a solution to two of the industry’s biggest problems: extortionately high fees and centralized power. They utilize the innovative capabilities of Blockchain technology to enable freelancers and customers to connect directly over a secure network that protects both parties, eliminating the need for expensive middlemen. As a result, fees to freelancers and customers are significantly reduced. By eliminating the middleman, UberPro also puts the power bank in the hands of users, meaning they don’t have to worry about the effects third-party decisions will have on their career or business. How did UberPro come to be? UberPro is the result of many years of frustration felt by freelancers, customers and entrepreneurs at the unfair restrictions enforced by certain freelancing platforms. Freelancer Society is a global group of freelancers and clients, openly discussing the freelancing industry and coming up with solutions of how to make things better. They’ve partnered with several entrepreneurs to develop the UberPro platform. As the team is global with first-hand experience in dealing with centralized freelancing platforms, they know the pain of freelancers and what solutions are necessary. Apart from developing UberPro, the Freelancer Society is a platform that provides much-needed support, guidance and resources to freelancers. UberPro is a global team of freelancers and entrepreneurs who joined together to create the world’s first decentralized freelancer community. With its highly experienced team based out of Panama, UberPro is emerging as the new leader among freelancer platforms and communities by revolutionizing the freelancing industry.